i’m often asked who my fashion “inspirations” are, but i’ve always been a bit hesitant for fear of falling into the traps of celebrity worship (as i explain in more detail here). 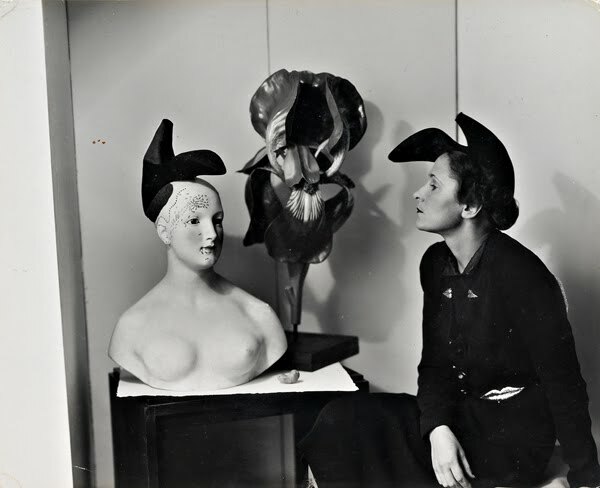 but lately i’ve been seeing elsa schiaparelli’s designs and influences popping up all over the place, so i thought i’d share some of my affection for her work with my readers. 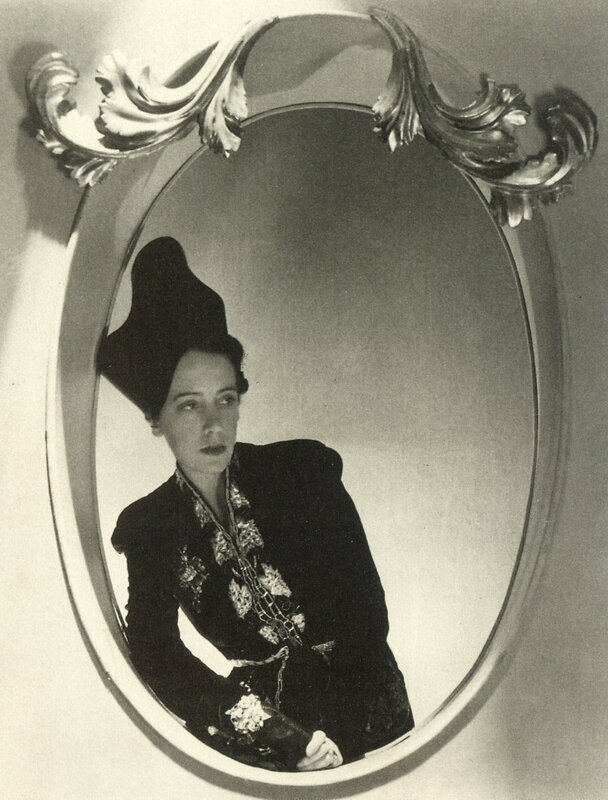 Schiaparelli was an ardent rebel and feminist who came of age at a moment of ferment in art and politics that ratified her disdain for conformity. 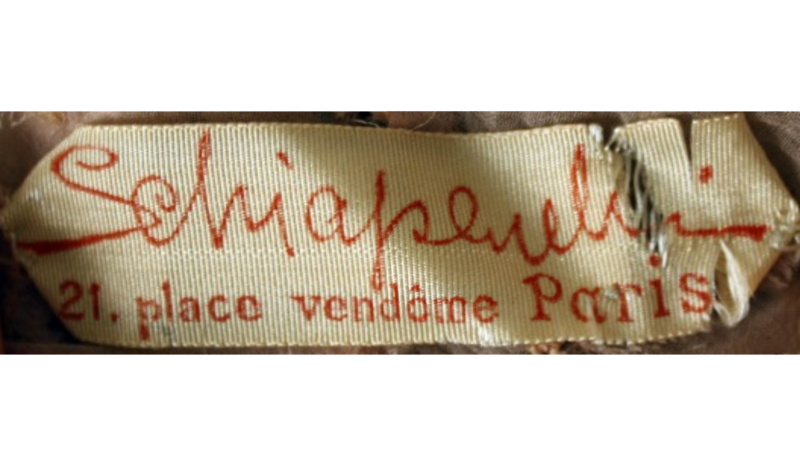 Schiaparelli was involved with the Dada movement at its inception in Greenwich Village, after the First World War. 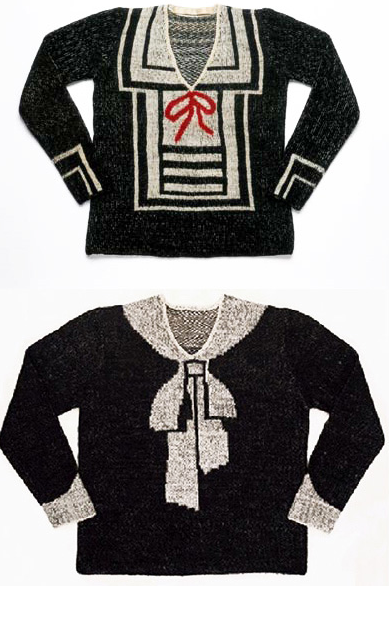 to top it off, she made gorgeous designs that even eighty years later, are astoundingly wearable and modern. Anna Batista does a great job pointing out how schiaparelli’s influence can be seen even in ready-to-wear collections from last season in her article about the evolution of vintage, Vintage Mutations. i think her point is best illustrated with these two pairs of sunglasses juxtaposed. which ones were made in 1937, and which in 2011? perma-scowl often makes me half-laugh, half-cry in solidarity when she posts schiaparelli’s designs on her tumblr with comments like “crying over you” and “all of my sighs/crys.” some of her designs are just so astoundingly beautiful and you want them on your body so bad, it DOES feels tragic that you can’t. why yes, i am being a bit overdramatic, but drama is part of why i love her work! her collaborations with jean cocteau and salvador dali can attest to that. 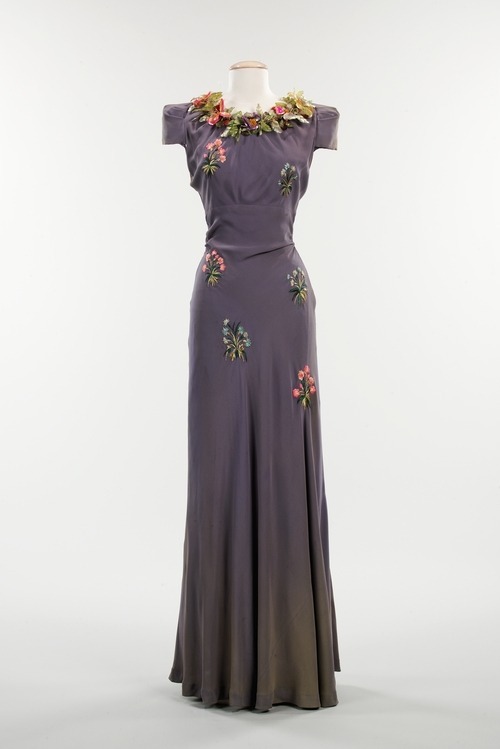 According to the Victoria and Albert Museum, “this dress was part of Schiaparelli’s famous ‘Circus Collection’ of 1938. 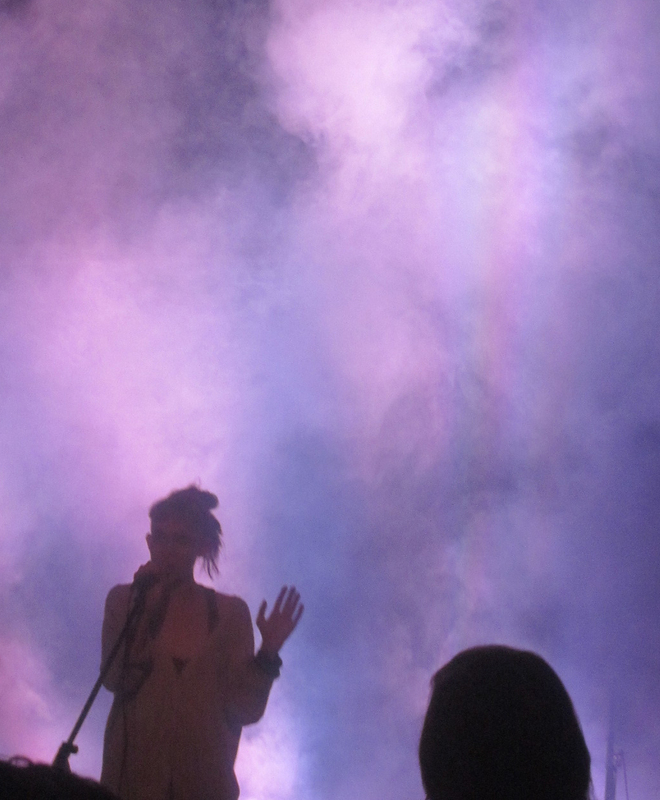 It was a riotous, swaggering fashion show that attracted a great deal of publicity. Clothes were decorated with acrobats and performing animals. The models wore clown hats and carried balloon-shaped handbags. The Tears and Skeleton dresses must have been doubly shocking amongst all this madcap gaiety. Dali’s patron, Edward James, gave these dresses to Ruth Ford, the sister of the Surrealist poet Charles Henri Ford.” sounds like my kind of drama. I’m reading this fabulous article in the New Yorker about designers Shiaparelli and Prada. 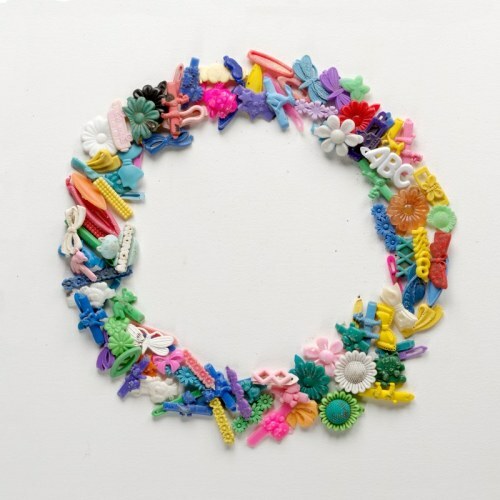 It references the politics of fashion, feminism, communism and thought of you. what a compliment! and what a great read. the article itself is more of a juxtaposition between Prada and Schiaparelli but still worth a read, regardless of your interest in either (or both) of those designers. 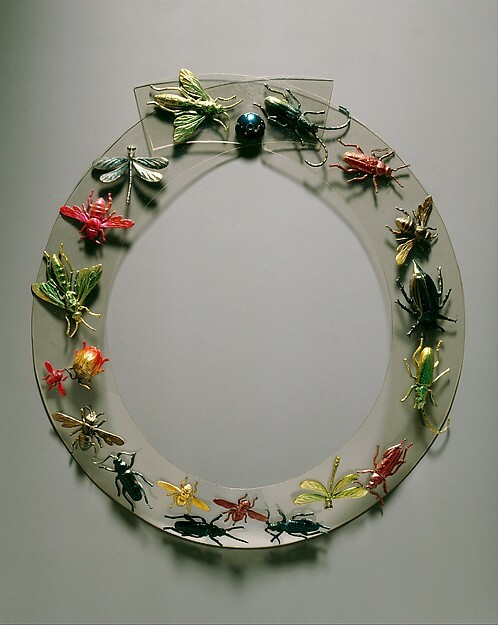 i could go on and on about how much i love her designs and her work and her collaborations with dali (which in my opinion are the best works dali produced) but instead i’ll just leave you with a bunch of photos of her gorgeous designs and some recommended reading. enjoy! 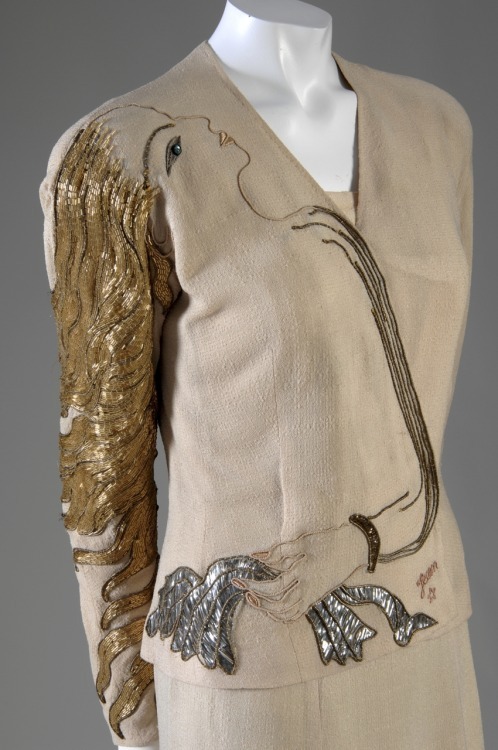 yes, the evening gowns are nice to look at for daydreaming purposes, but i can’t help but forever lust over her trompe l’oeil sweater designs from the 30s – which i could wear to work tomorrow. 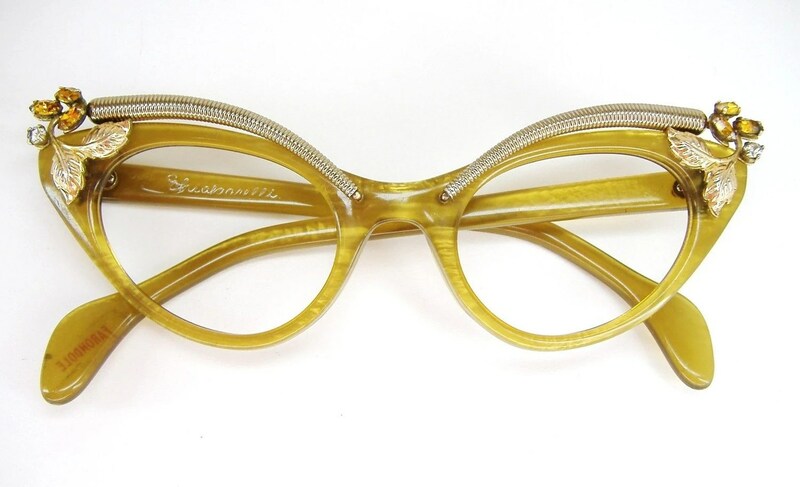 and last but not least, she is responsible for some awesome accessories – including these in your face frames. in summary: someone please be my sugar mama/papa, buy me all of these things so i can drape myself in gorgeous art. please and thank you. i hope you enjoyed the eye candy. Shock of Pink: How a Colour Shaped Schiaparelli’s Vision by Lucie Goulet at WORN FASHION JOURNAL’s blog.